It’s time to make a knitted or crochet poppy and, if you have the time, craft a selection and gather them into a wreath. 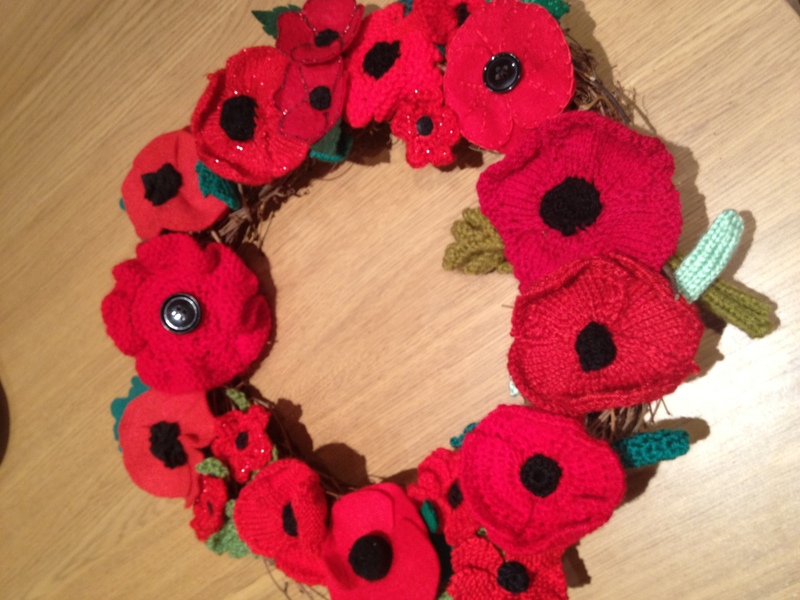 Are you inspired to knit a poppy, either for yourself or for charity? Well, we have TWO free poppy patterns for you to try – one that is crochet and one that’s knitted. 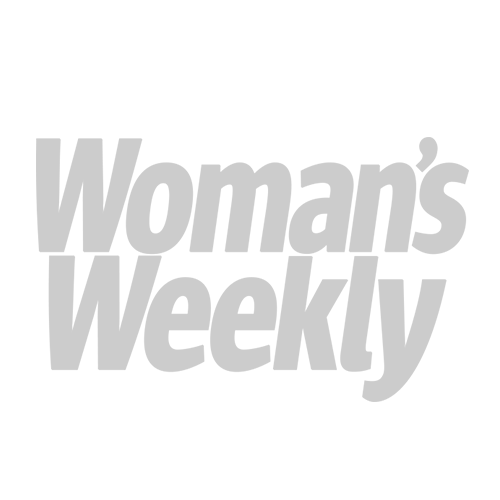 Just click on the ‘download now’ button on the left, add Remembrance Day Poppy Knitting And Crochet Patterns to your basket and checkout as normal. The patterns come in one simple download so you can decide whether you’d like to crochet, knit (or both!) your poppy. In the past you have amazed us with your charity makes including knitted blankets for cats and dogs, 7,000 hats for the homeless of Manchester, blankets and jackets for premature babies – plus record-breaking bunting and a wonderful Woodland Glen. To commemorate 100 years since the start of World War One in 2014, we asked you to to send us a knitted or crochet poppy. You didn’t let us down, when the campaign closed we had received over 4,000 beautiful poppies in all shades of red. 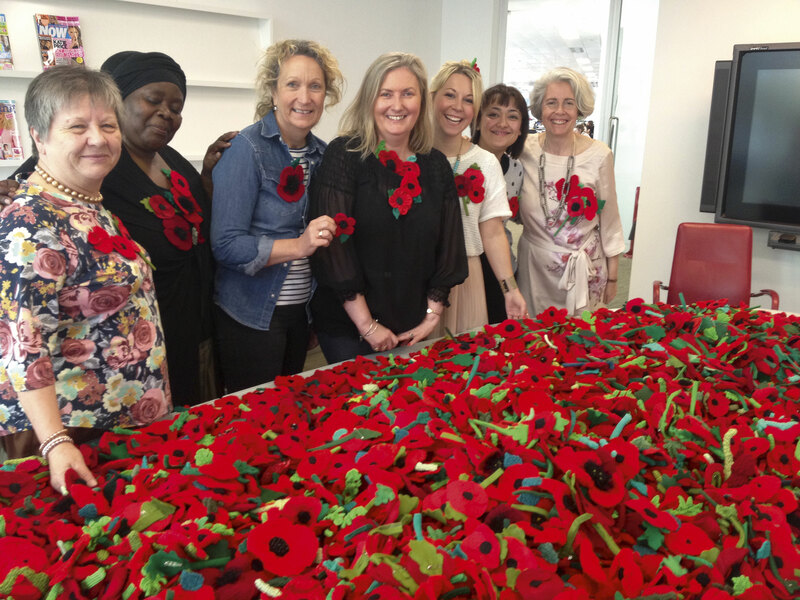 Just look at that sea of and knitted and crochet poppies below, you all did a fantastic job! 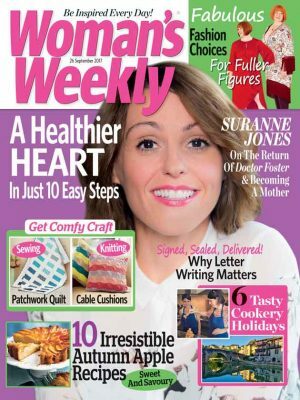 With all the poppies we were sent, Woman’s Weekly thought it would be a nice idea to get readers to make poppy wreaths to distribute around the country, to lay on WWI memorials, in memory of those who fought for us. 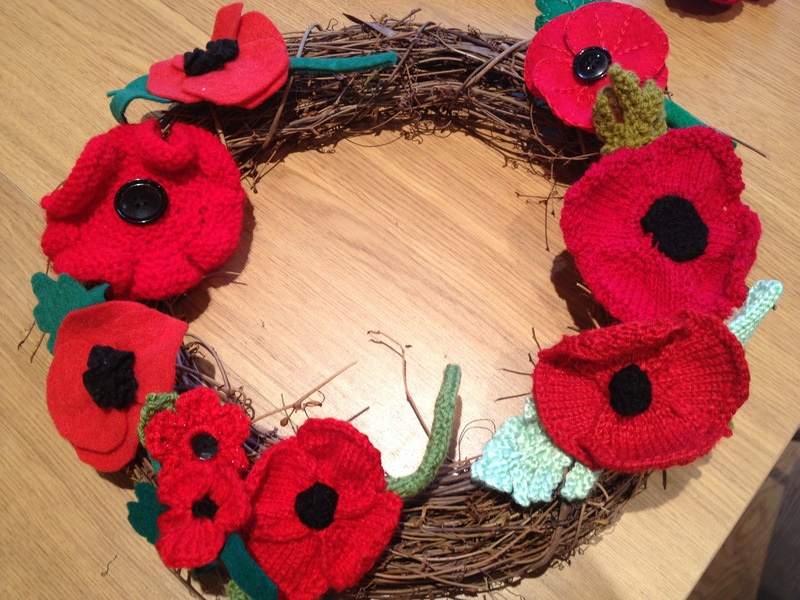 Over 300 wreaths of knitted and crocheted poppies were placed around the UK and the Woman’s Weekly team also made some here in the office. Thank you to all the wonderful people that helped with the poppies and wreaths to commemorate all of those that lost their lives. If you would like to make your own poppy wreath for Remembrance Sunday this year, please see our guidelines on how to do so below. 2. Leaving the poppies in position, pick up one and sew through the back of it. Thread the thread through the twigs and then back through the back of the poppy. Pull to anchor the poppy on the wreath base. Repeat the stitch (this should be possible with the poppy in position on the wreath. 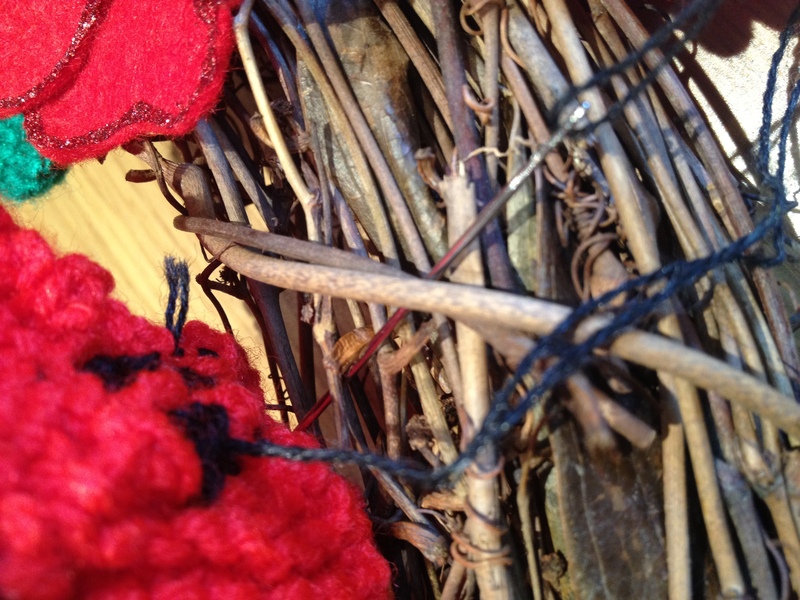 If not, thread the thread around the wreath twigs once more) to ensure the poppy is securely anchored to the base. Knot and cut the thread. 3. Repeat with each poppy working your way round the wreath. You will probably find the poppies ‘bunch up’ a little more once they’re sewn into position, so use the spares to fill any gaps or add more bulk if you feel the wreath needs it. 4. Don’t forget to attach the tag before you lay the wreath in position. 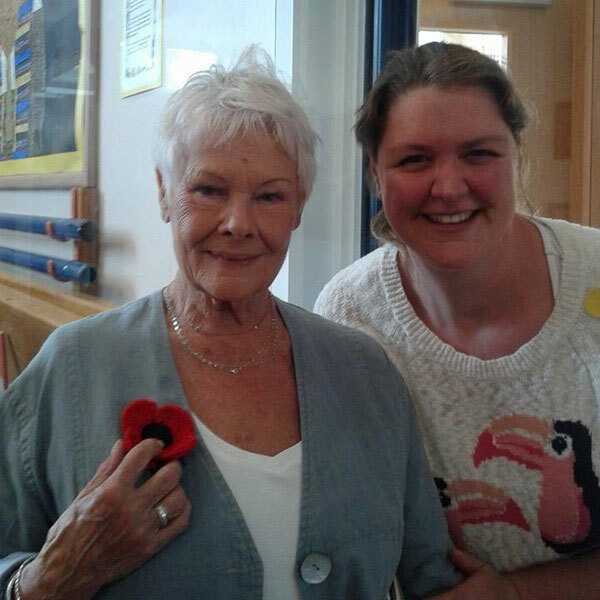 Even Dame Judi Dench loves our knitted poppies! It’s fair to say we nearly choked on our chocolate biscuit when our lovely reader, Ruth Valentine, sent in this picture. Yes, that really is Ruth smiling with the one and only, Dame Judi Dench. Dame Judi is proudly wearing a knitted poppy that Ruth made for charity. That’s definitely one to keep and show the grandchildren in the future, Ruth. What a lovely story – and such a gorgeous picture too. Thank you for sharing this with us, Ruth. 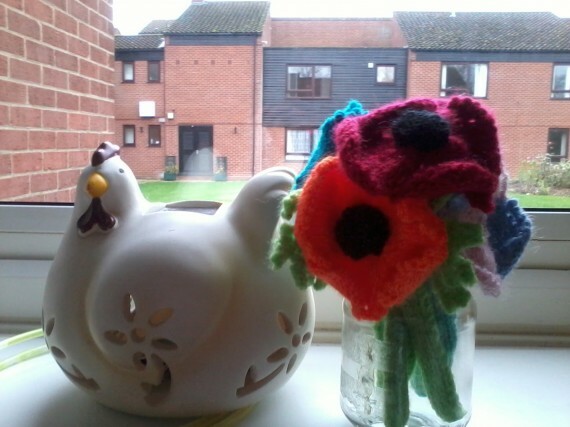 Woman’s Weekly reader Rosalind made a posy of lovely knitted poppies using our free downloadable pattern. ‘This is your pattern – knitted in dk wool, in various colours, and placed in a jam jar for an authentic vintage look,’ she told us. Is crafting your thing? Well, we’ve got something for everyone here – so, how about making this beautiful poppy card? It might look complicated, but with our step-by-step guide, you’ll be making this in no time.